Writing is a great way of expressing. Indeed it is true but sometimes we fail to appreciate all the efforts a writer put in to present his/her work before us. Ye, we read the book and express our thoughts about it. But with our series of Superhero With Ink, we are trying to read the thoughts of the author. And today the superhero badge goes to TrayCee. 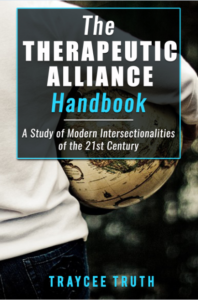 The Therapeutic Alliance Handbook is a study of modern intersectionalities of the 21st century which, includes ethical and holistic social work within current environmental factors and socio-economical practices and governmental policies. The handbook explores a specific set of examples of social “isms” regarding cultural ageism and adultism, racism, and sexism. Thus, various intersectionalities which have occurred in my life has prepared me to write and composed these experiences into this book. 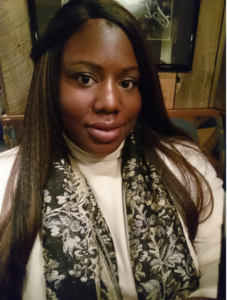 The author TrayCee Truth is a holistic civil servant, who holds a degree in social work and is currently working towards her master’s degree in advanced clinical social work. She has worked steadily in various areas of the social service systems within Canada throughout the last 15 years for systematic change on the micro, mezzo, and macro levels of social work ethics and essential practice measures. She has had vital and progressive roles in areas such as provincial policy and assessment divisions, mental health court diversion programs, youth probation, child-welfare, public and private education systems along with efforts in advocacy rights for all genders. My motivational drive came from a series of experiences throughout my professional career and academic studies. I actually had more than one of my professors within both of my BSW and MSW studies profess the need to share my critical knowledge with others. These individuals stressed that my writing abilities were a gift and needed to be shared by writing professionally as an author and/or a freelance writer on current events within social service sector and global issues. Hence, this is how the idea and then in-depth content was created concerning my book. 4)What are you currently working on and what are any future projects you are working on as well? I will be presenting a presentation poster on issues of ability and cultural ableism for the University of Regina’s Congress of the Humanities and Social Sciences conference in the late spring of 2018. Also, I’m actively promoting my current book and working on the second book within the Truth Alliances Series. There are also some collaborative efforts with other authors in works for future books and writing projects for 2018/19. I am always writing down some form of information throughout my day to day life. However, I was not confident to put my efforts forward for others to read because I felt my thoughts were subjective to matters of hardship and inequality. Thus, after being encouraged by the course of experience of change to omit lack of confidence. I began to push myself forward by understanding that my thoughts could manifest into sentences of expression and in-depth understanding of the critical theory regarding intersectionalities. I do not have a favorite author per say. However, I do enjoy reading left of centered news stories and political pieces because it strays away from current news stories that are heavily saturated within our local and nation-wide media outlets. When I do have spare time, I enjoy listening to a wide range of music, inspirational speeches, and commentary that shape the world we live. Aside from this, I also enjoy view works of art from around the world from many different genres of expression and social influences. I do not have a favourite author per say. However, I do enjoy reading left of centred news stories and political pieces because it strays away from current news stories that are heavily saturated within our local and nation-wide media outlets. My favourite book has always been “The Colour Purple” since I was a child. I remember fondly reading each word and visualizing each scene as it played out in each chapter. Writing is an on-going process. So, enjoy the tedious process of many re-writes and numerous attempts in getting your final draft right. Remember, there is no actual rush towards written perfection. For example, start writing on your phone in a notebook app. Then transfer your works to Word. That’s how you get things done. Just start… Watch what happens when you believe and begin the process.